Coventry Law Centre is the UK’s largest Law Centre. Founded in 1976, our purpose is to fight social exclusion, and to effect change in society by increasing rights awareness and using legal processes to fight poverty, inequality and discrimination. Our services are free and we seek to make them accessible to those who are vulnerable, disadvantaged and socially excluded. We are pioneering new ways to achieve this by working in partnership with other agencies and community organisations. We employ 37 staff, 9 of whom are solicitors. 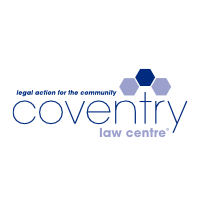 The core of our service is based in Coventry but we have recently expanded to offer a specialist housing advice service in Warwickshire, and we’ve opened an office in Birmingham (Birmingham Community Law Centre), where we specialise in migrants rights. The breadth of areas of law we cover enables us to offer a holistic service which provides a pathway out of social exclusion. However, the effects of the recession coupled with reductions in public services as a result of government austerity measures have put many of our clients under severe pressure. The environment for our target client group – those living on the margins, often in poverty and facing multiple and severe disadvantage – is bleak, and the environment is becoming harsher. Our response to this has been to evolve our practice as a legal advice centre to better meet this growing need. We know our work transforms people’s lives; our independence and the rules by which we operate provide a unique opportunity to build relationships of trust with our clients. What is needed now is to combine this in new ways with other organisations to take it much closer to our clients and deeper into the communities in which they live, and offer more complete and more sustainable solutions to the problems they face. We are pioneering this new way of working with our Troubled Families Project and our Young Migrants Rights Project. We find innovative ways to reach these clients; we take the service out to their homes; we build legal capability while we work with them; we don’t close their case but maintain contact to prevent other problems occurring; and we have connected our service with other forms of complementary help that, alongside our expert intervention, really allow these vulnerable clients to move forward.